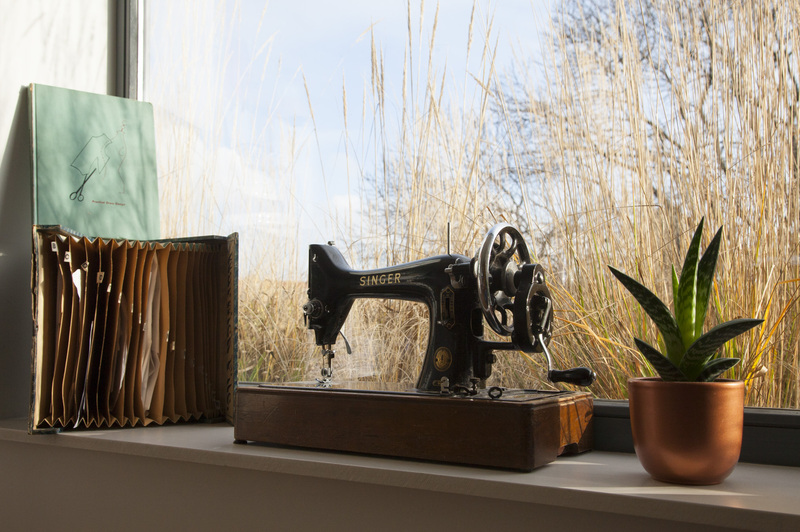 I received an email from an English freelance journalist whether I wanted to send over some pictures of my sewing room. I asked some time to upgrade it a bit and afterwards I made the pictures below. I love my sewing room. It’s full of treasures that are important to me. This doesn’t only counts for this room in our house by the way. 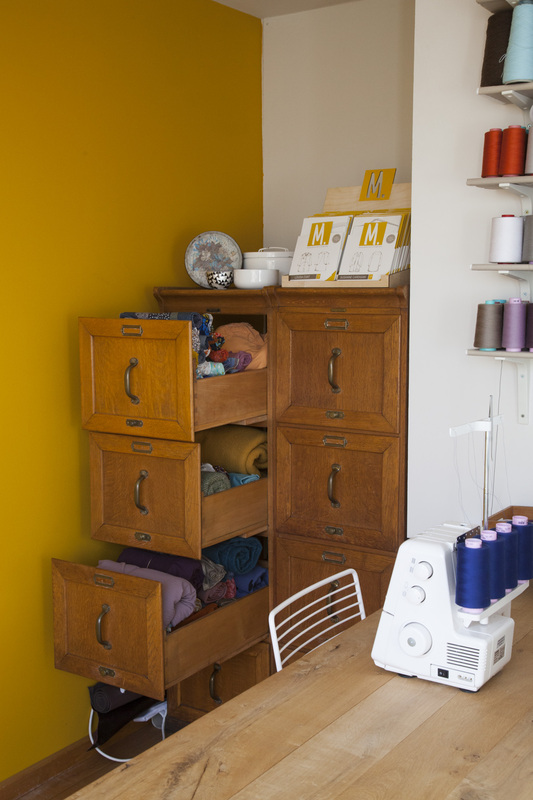 When I installed my sewing room, my personal mission was to spend as little money as possible. That’s why I visited my favourite thrift stores again and this is the result. 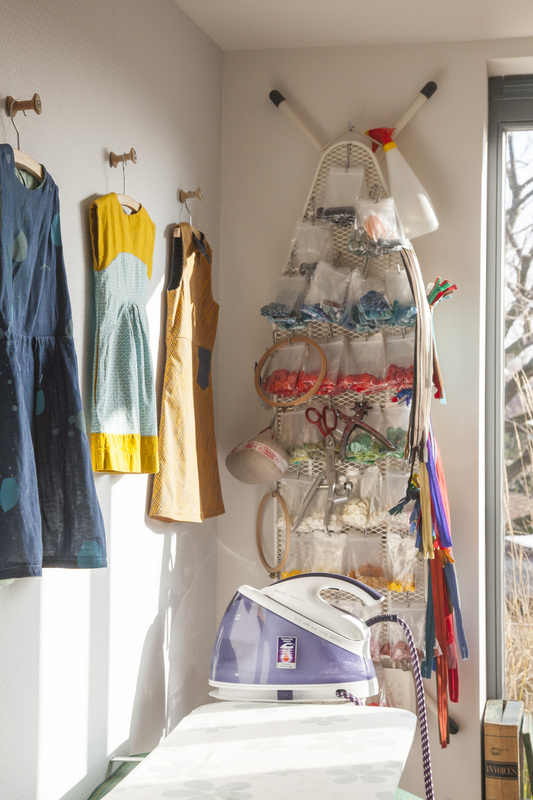 It’s a sewing room is rather small. Especially since I use it often. That’s why I want to keep it well organised and tidy. I can’t work in a mess so everything has a certain spot and has to stay there! On the main table I have 3 machines: my sewing machine and serger. On the end of the table (see very last picture), you can find my knitting machine. I use the large table top for my instruction pictures so when I’m making a new pattern you can find some extra lights here. Crowed but functional. I don’t have that many fabrics. Just 3 drawers. One for woven fabrics, one for knits and a 3rd one with thick coat fabrics and other stuff for women. I do have a lot of thread and buttons. I think I love buttons most. Whenever I’m at the flea market I find some. I store them on an old iron board. Some Ikea hooks and plastic bags make it really easy to find a perfect button for every project I work on. Other stuff like zippers and scissors are stored here too. On the wall I used some old bobbins as hooks to show some of my favourite projects. Some I blogged, some I didn’t. Oops! The Maggie Mae dress in the middle is one of my all time favourite creations. 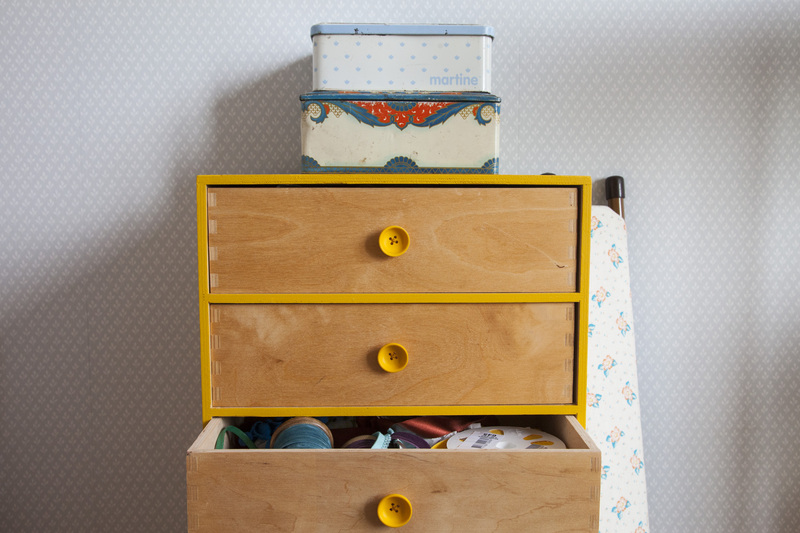 I pimped an old Ikea drawer unit with some yellow paint (left over from the wall) and some of my favourite buttons that I’ve sewn on. Bjorn never thought that it would be functional but yes it is! For a while already. 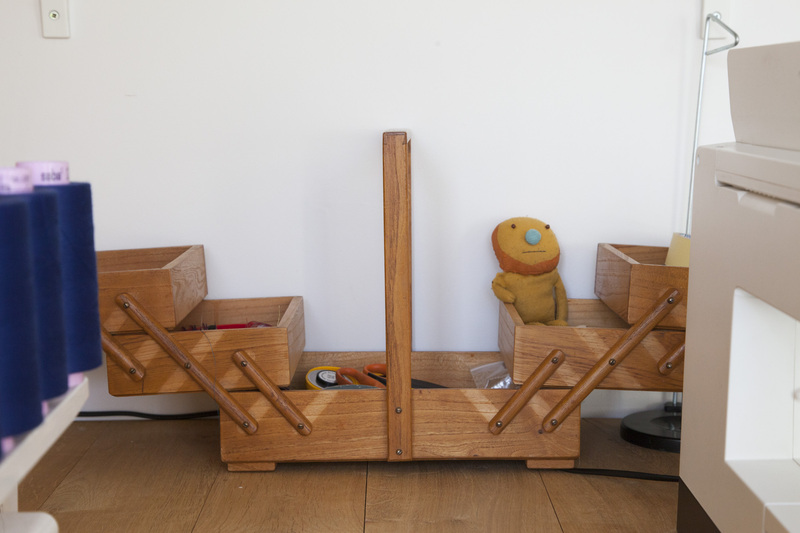 I store haberdashery in the drawers and because I have too many, I added some old boxes on top of it. The small iron board is a thrift store find and I used a left over fabric to pimp it. 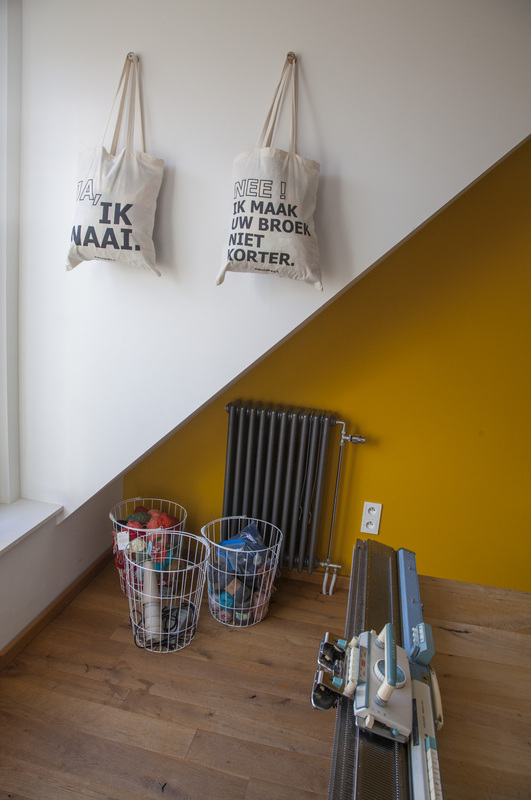 On the opposite wall, I added two bags I got as a present from Linsey from Pauwels (a fabric shop in Antwerp that has been closed down in the meanwhile. A real pity as she was the person that showed me how to use my knitting machine.) It states: Yes, I sew… No! I don’t shorten your pants. So funny and true. I think no one like to shorten pants, right? Inside these bags I store my fabric left overs. 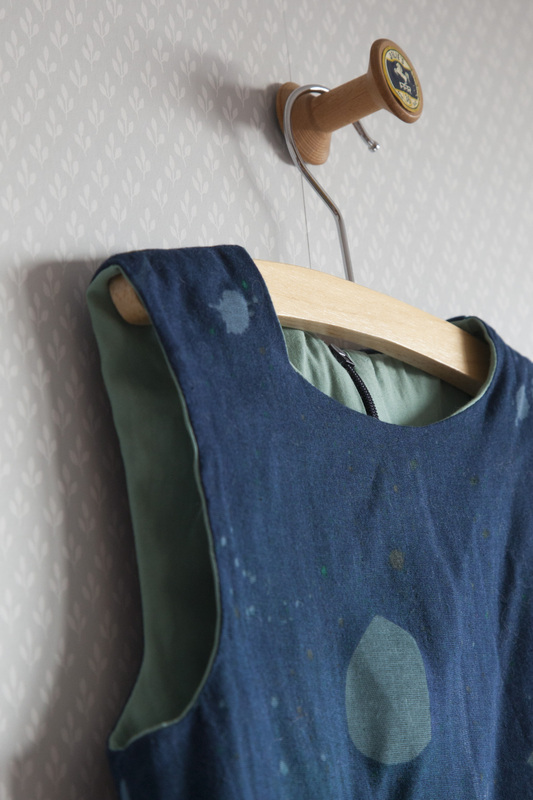 One for woven fabrics, one for knits. Through the window you can see a part of our green roof. So I have a great view from my sewing room actually. In front of it, you can three precious objects: my very first sewing machine that I used!!! 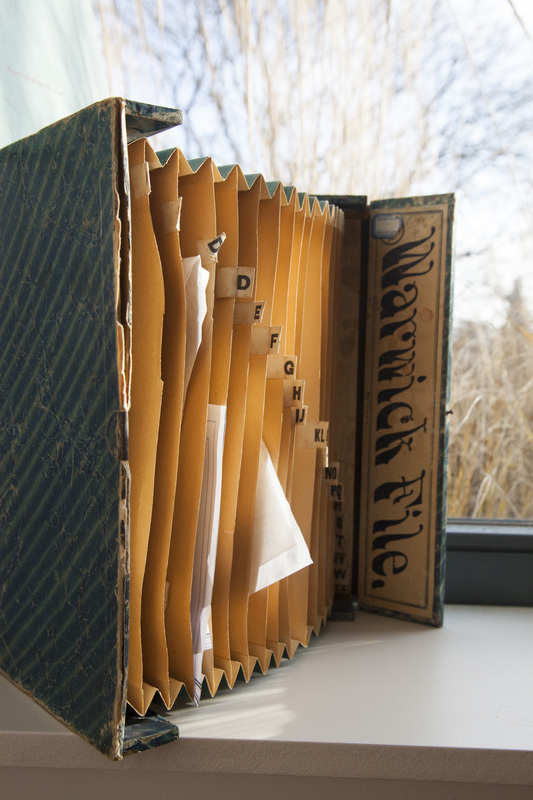 An old invoice folder to store my traced patterns and a vintage pattern drafting book. All gifts from Bjorn. I don’t keep all my traced patterns. I only keep my adult patterns and I only keep them when I think I’ll use them again. All the kids patterns are always thrown away, besides my own patterns in the size I use at that moment. All the rest goes to the bin. I rather use a new pattern in stead of using the same pattern over and over again. (There are so many great patterns that I still want to try! )The only exception is the Finnlayson sweater that I made already 6 times for Bjorn. I painted on of the wall Compagnie M. yellow. Of course! In the drawers you can see that I roll my fabrics. 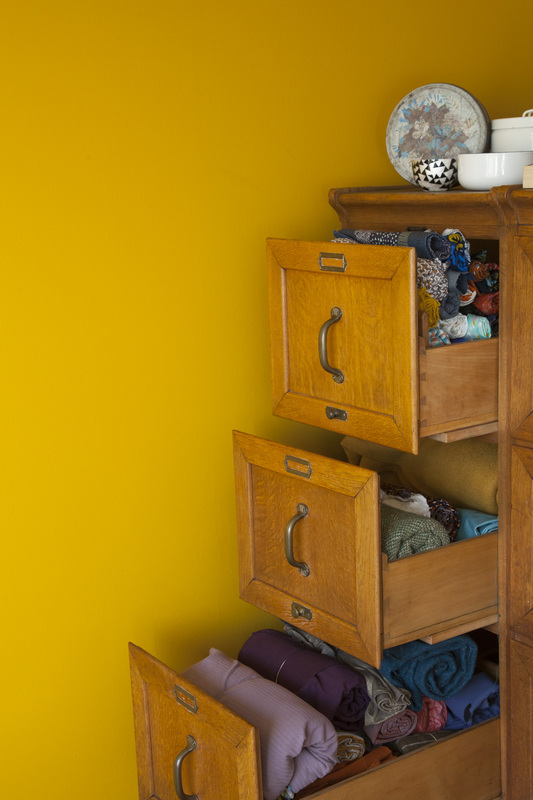 This way I can find all my fabrics easily without making a mess. 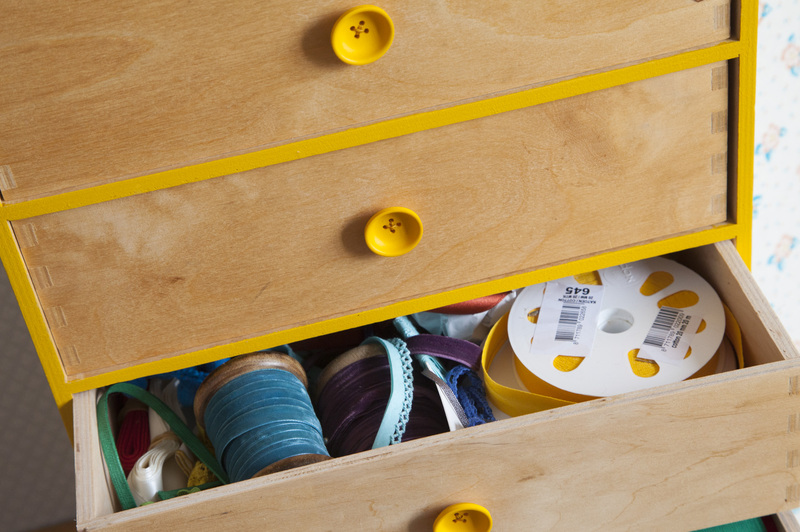 On top of the drawer you can spot some extra boxes to store… more buttons. Single ones. 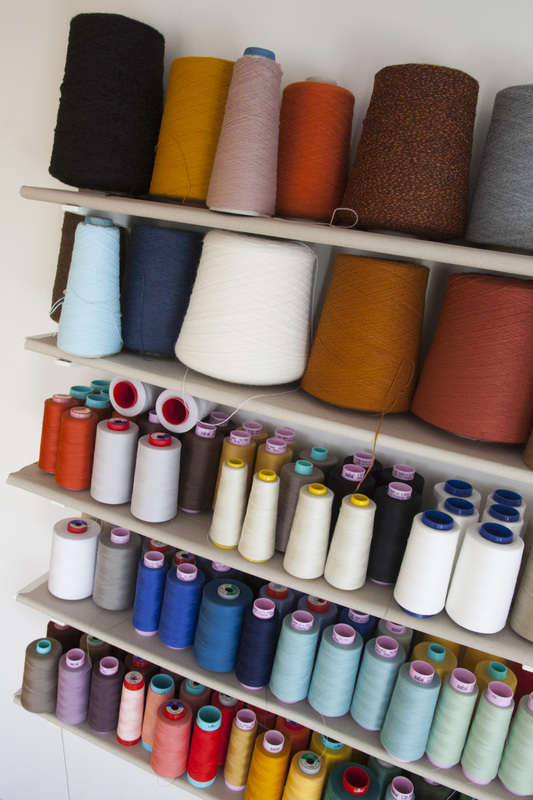 Yarn and thread heaven! I used old fabric bolts to make some shelfs. I love the idea to up-cycle and I had this idea for years already. Finally I installed them! (Or better: Bjorn did). More color love! We once bought a stock of thread so I have even more at the garage. Oops! 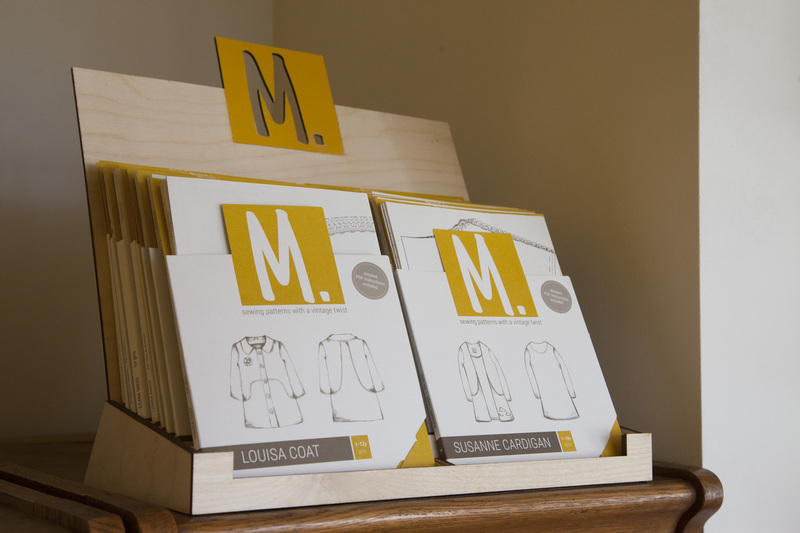 In a display on my drawer I store all my own patterns. How I love them when you see the whole collection together like this. And last but not least, a look on my knitting machine. One from the 60s! Last week I made a first sweater on this machine and I love the result a lot. I think this knitting machine will become more and more important to me. I made my very first knitting pattern and I think I’ll surely make more in the future. I might even share some soon! If I find the time to write them down properly. What do you think? 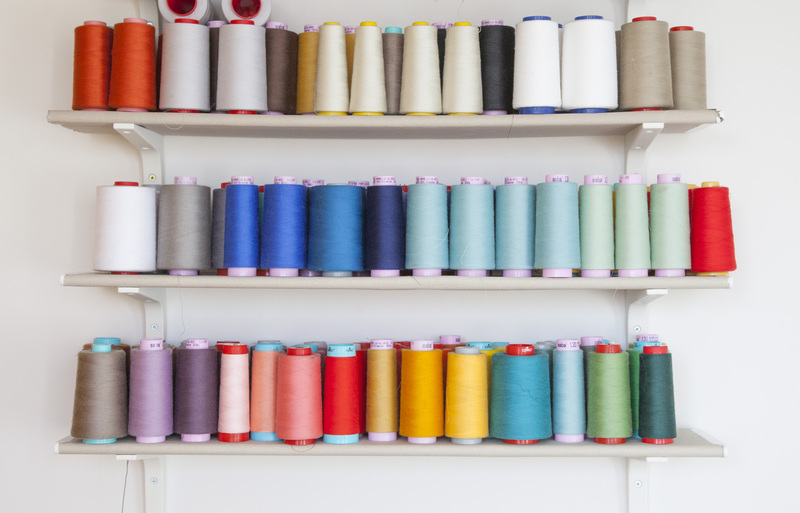 Does your sewing space inspire you too to make some beautiful creations? Mine does. Although it’s basic, I think it’s super functional. The only thing I’ll add soon is an old lamp on a small shelf against the yellow wall. Next to this lamp, I’ll add a frame with the text ‘hier brandt de lamp’ which means that all ideas were born in this sewing space. I’m sure the room will change some more in the future, as I want some extra light too. But this is perfect for now. hihi! Dat is dé manier. Ik moest in mijn geval Lisa er ook uitzwieren. Oeps! Maar ze slapen wel graag samen. Hoewel ze soms toch ook wel heimwee heeft naar haar eigen kamer. Daarom is het onze naaikamer. En dat klopt ook wel wat, want het is Lisa die de creativiteit heeft geërfd. haha, kei herkenbaar. bij de laatste opkuis heb ik al het speelgoed de deur uit gezwierd en als ik thuis werk, werk ik niet meer in ‘den bureau’, maar gewoon aan de keukentafel. iedereen thuis zegt tegenwoordig vaker naaikamer dan bureau en als er eens iemand bureau zegt, wordt er eens hartelijk mee gelachen. Thanks Els! Een hele zolder klinkt wel tof. Zou ik ook wel willen. Al zou ik het minimalistisch houden. 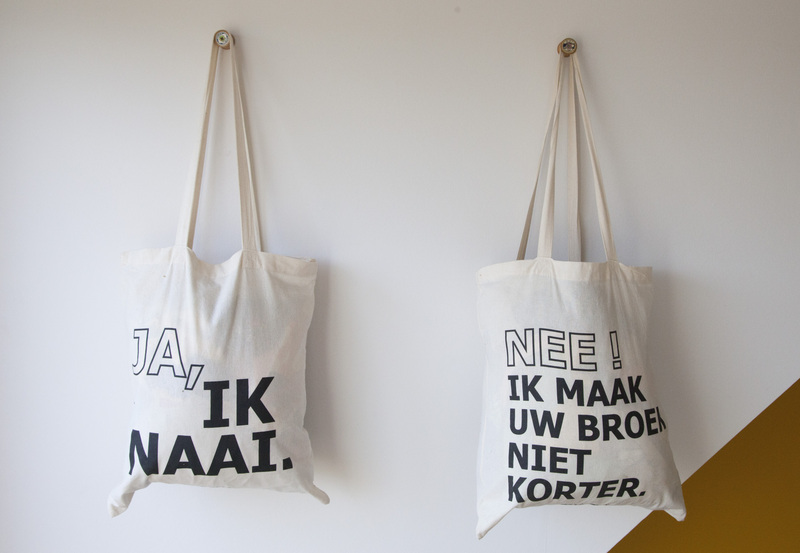 Een Marie Kondo fan hier. Wat ik niet gebruik moet eruit. hihi! What a beautiful space! It is truly inspiring :) Now I can’t wait to properly set up my sewing space :) I have an old office desk I use as my sewing desk. We moved it into the dining area a night before the little one was born (that is almost 1.5 years ago) but it still doesn’t feel like my sewing home. Thanks Jenya. It’s so great to have a space of your own. So I hope you can find time soon! Nee, nee, héél mooie kamer, Marte, net zoals jouw hele huis! Allez, misschien eerder: ik heb eens iets uitgewerkt en het past. Goed zelfs. Ik heb een nieuwe lievelingstrui! This is absolutely beautiful in it’s form and function way. 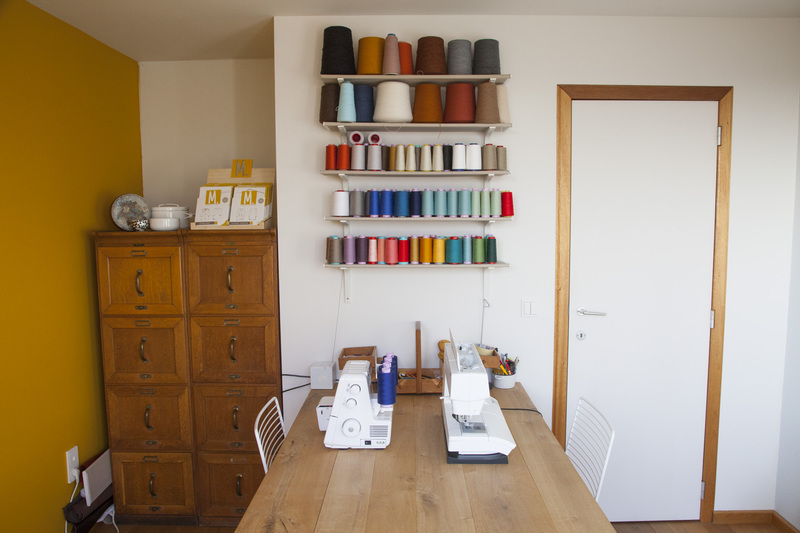 I would be very inspired to sew here! 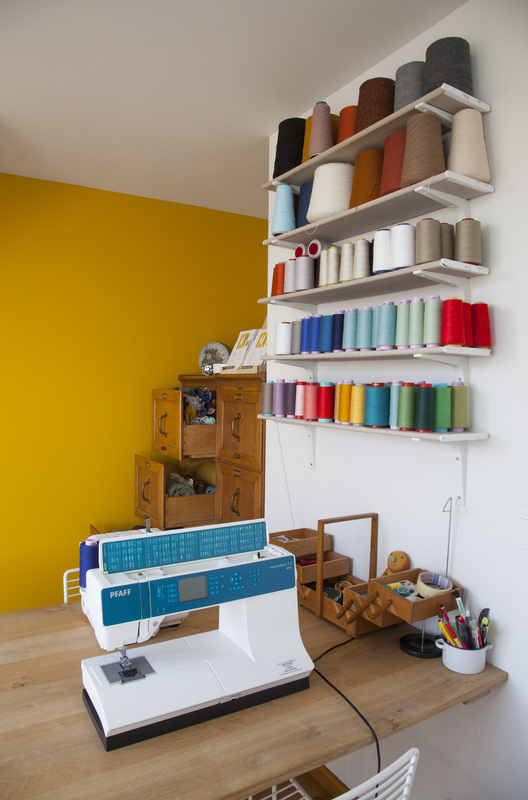 Please link up your post over at Project Run & Play so everyone can come visit your lovely sewing space! Ik naaide vroeger ook in de woonkamer maar nu het mijn werk is, had ik écht een eigen plekje nodig. Ik ben dus super blij dat het er uiteindelijk van gekomen is! Super mooie, ordelijke en effciënte naaikamer! Ik ben meer een chaos-type, helaas :-). Oh ik amuseer me rot met die breimachines. Ik kocht er eergisteren een nieuwe en ik kan niet wachten om er vanavond mee te experimenteren! Als je graag wilt leren werken op je machine, moet je de website in het oog houden want ik ga in de toekomst misschien wel eens een cursus organiseren. Maar eerst zelf nog wat ervaring opdoen!